Officer Will Phillips was struck and killed by a hit-and-run driver while on bike patrol training at approximately 12:45 am. He and two other members of the bike patrol team had just finished their shift and were conducting a training ride on department issued bikes. They were riding on U.S. 40 between Greenfield and Knightstown when he was struck by a vehicle which then fled the scene. All of the officers were wearing helmets and had lights on their bikes on uniforms. The driver of the vehicle that struck Officer Phillips remains at large. Officer Phillips had served with the Greenfield Police Department for four years. He is survived by his wife and two young sons. 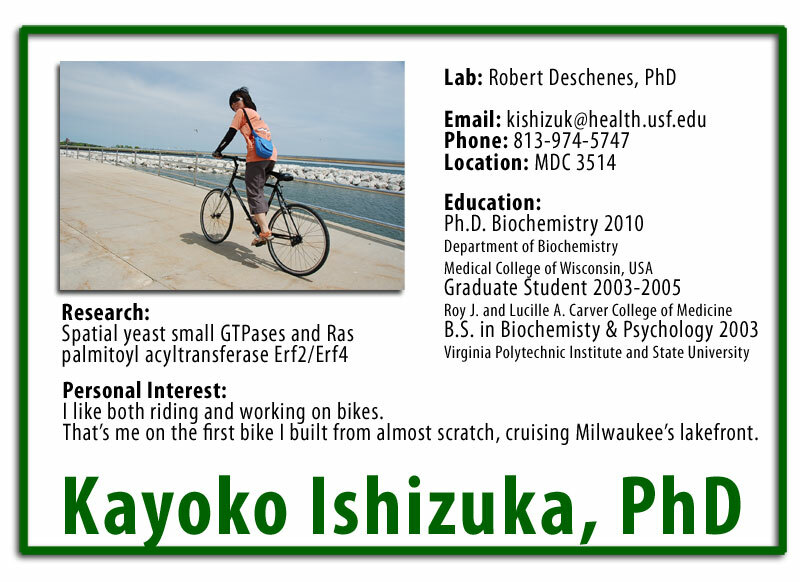 Many of you have asked about memorial information for postdoctoral fellow Kayoto Ishizuka, PhD, who was killed last weekend while riding her bicycle home from her laboratory in Medical Microbiology in the College of Medicine. Her family is now here from Japan, and the department, chair Bob Deschenes, with many friends, are holding a lantern ceremony memorial on the USF Tampa campus at Simmons Park (West Pond) tomorrow, Friday, 5-8pm (Magnolia St.-East of Moffitt). Several offices, the College of Medicine, the department, the graduate school, the dean ... have all contributed to a travel award in Dr. Ishizuka's name. Her bravery in studying abroad is an inspiration. If you wish to contribute to the fund, please contact the Department of Molecular Medicine, Dana Cole, dcole@health.usf.edu. If you ride a bicycle in the Tampa Bay area, you know the feeling when you hear about yet another bicyclist who has been killed while riding a bike around here. It's a kick to the stomach. Since July 29, the fallen cyclists have ranged from a retired 75-year-old two-star admiral in Tampa to a restaurant dishwasher in St. Pete to an elementary school teacher in new Tampa to a 30-year-old PhD cancer researcher near the USF campus. Everyday people -- not unlike you or me. The way I deal with issues is by hopping on my bike and cycling it out. So another bicyclist, Josh Holton, and I are leading an "Honor The Fallen Bike Ride" on Friday at 7 PM from the Seminole Heights Garden Center, 5800 Central Avenue just north of Hillsborough Avenue in Tampa. It will be a respectful 15-mile bike ride to downtown Tampa and through Channelside and Ybor City and back to Seminole Heights. Nothing fancy -- kind of like a low-key Critical Mass, kind of like a Ride of Silence. A reverent ride to remember those bicyclists whose lives have been claimed on the streets around here. Helmets and lights are required. Easy 10-12 mph pace. All riders ride at their own risk and assume responsibility for their personal safety. So many times, a bicyclist is killed by a car and all you read is a four-paragraph blurb in the local paper. Little is mentioned about that person except the place and time that he or she was struck by a car. Today, a friend at the USF campus passed along these USF Health announcements about Kayoko Ishizuka, PhD, who was killed by a hit-and-run driver early Saturday night. Kay was wearing a bike helmet, her bike had a light and she was in the bike lane. Kay's friends have begun a Facebook page in her memory. The chair of her department, Dr. Robert Deschenes, is talking with her family in Japan and will organize a memorial. This weekend, Dr. Deschenes has been working with Dr. Stephen Klasko, College of Medicine Dean and Vice President for USF Health, who wants to convey his sorrow: "Our greatest asset at USF Health is our students and Kay was among the best and brightest. She dedicated her life to finding answers to difficult health problems on a molecular basis. My most sincere condolences go out to her family, fellow students, teachers and everyone who would have been helped by the great research this wonderful scientist was accomplishing." It is with extreme sorrow and a heavy heart that I must inform you of the tragic passing of Kayoko Ishizuka, a postdoctoral fellow in my laboratory. Kay died early Saturday morning when she was struck by an SUV while biking home from the lab. Although emergency crews arrived quickly, she could not be resuscitated. 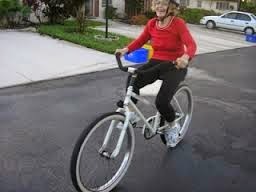 An experienced bicyclist, Kay was traveling in the bicycle lane, wearing a helmet, and had flashing warning light on her bike. Unfortunately, the driver of the SUV fled the scene after striking her. Kay was a tremendously talented student who I was proud to have mentored through her PhD training at the Medical College of Wisconsin. She was a native of Japan and came to the US to do her undergraduate training at Virginia Polytechnic University and her doctoral training at MCW. Kay subsequently moved to Tampa to do an interim post-doctoral fellowship with us while applying for her next position. We are deeply heartbroken and saddened by this tragic loss. She will be sorely missed. Our thoughts and prayers go out to her family. After consultation with them, I will inform you of funeral or memorial arrangements. Bicyclists killed in the Tampa Bay area since July 29. May you all rest in peace. July 29: LeRoy Collins, Tampa. Retired Navy admiral. Sept. 9: Joseph Dyals, Tampa. Elementary school teacher. Sept. 11: Stephen Allen Ivey, New Port Richey. Died Sept. 13. Sept. 12: Neil Alan Smith, St. Petersburg. Restaurant dishwasher. Died Sept. 18. Sept. 25: Ishizuka Kayoko, Tampa. USF biochemistry Ph. D graduate. 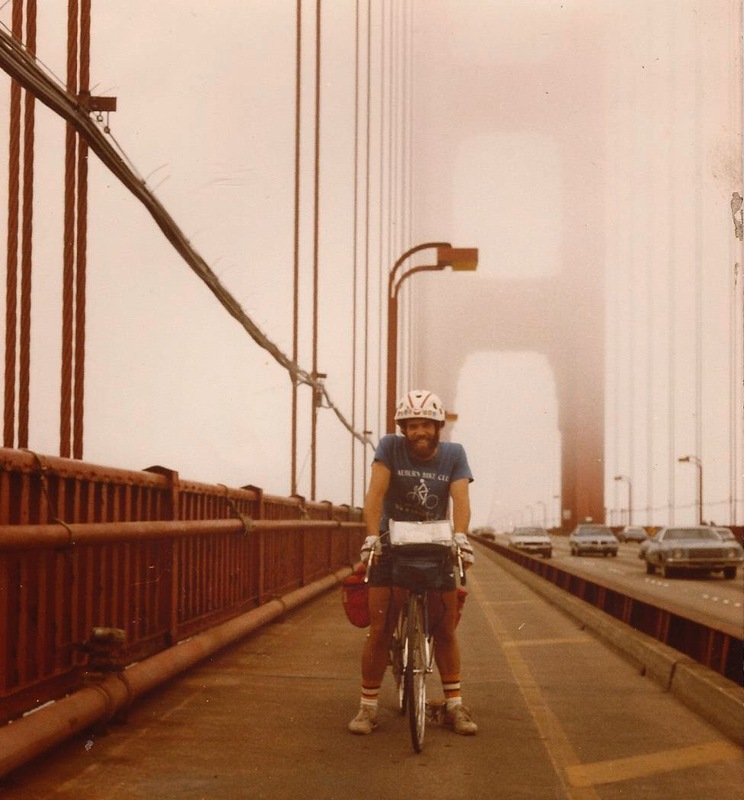 How many bicyclists have to be killed before Pam Iorio, county officials, DOT top brass etc. identify bicycle safety as a top priority and start building roads that can safely accommodate both bicyclist and car driver? Her name is Kayoko Ishizuka, 30 -- a recent biochemistry Ph.D. graduate and was working as a research associate at USF's department of molecular medicine. The woman who relies on her bicycle was pedaling south on BBD in the bike lane near University Square Drive when the hit-and-run driver hit her from behind. 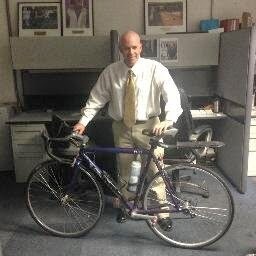 The St. Pete Times had a short story on the bicyclist death tonight on its web site. I wish I could report more upbeat bicycle stories that celebrate life by bicycle but drivers continue to kill bicyclists in Tampa and other places around here and I'm compelled to report those. If you adore bicycles, a Bucket List must is attending the Interbike bicycle trade show and the accompanying outdoor demo. They're all there -- the big companies and the small ones, the bike manufcaturers and the parts guys and every bell and whistle you could ever hope for on a bicycle. More than 20,000 people come from around the world to attend. This is the last year in Las Vegas for the bike industry's annual trade show. Off to Anaheim in 2011. This was my second Interbike event. Went with David Luppino, SWFBUD store owner of Just Ride Bicycles who used to own CBE and Oliver's, four years ago and finally made it back this year to network with bike industry leaders. I was able to hang at the display area of Tampa's Steve Toll, owner of ISM seats, the special saddle that Steve launched several years ago. The first two days of the week were spent in the dusty hills of Boulder City, about a 40-minute bus ride from the Sands Convention Center, home base for Interbike in Vegas. At Boulder City's Bootleg Canyon park area, it's two days of test-riding every bike imaginable from cruisers to the high-end road bikes to the fattest of fat tire mountain bikes. Tough to keep the desert dust off those fine threads. Any cargo bike will do. I test-rode this Salsa beauty -- the spearfish. Ate up the terrain. If you're a company that makes bike racks, this marketing ploy was inevitable. These guys served 1,000 hot dogs during the two days of the Outdoor Demo. Bootleg Canyon is the park area where the outdoor demo is staged. Who said Nevada is just flat desert? The Moots road bike -- beautiful titanium that I hope my pal Picot buys. Besides the usual displays of gorgeous road and mountain bikes, there were plenty of exhibitors showing e-bikes, cruisers and fixies such as these at the convention center. I found retailers were split about electric bikes -- some believe they at least get people out of cars but others don't like selling something that's not human-powered. The Surly Pugsly can mash urban or mountain terrain. I saw a guy on this bike cruising The Strip. If purple is your color, Pinarello has a road bike for you. Loved the Electra display -- Electra is in the Top 10 of bikes sold in the U.S. The Salsa spearfish model can eat up an off-road terrain. Wonderful all-around mountain bike. Love the Civia line, owned by Quality Bicycle Products out of Minnesota. QBP also owns Salsa. Local folks from St. Pete-based Profile Racing were there. And Bill and Ellen from Tampa-based American Classic wheelmakers are always an on the Interbike scene. Every bell and whistle in the bike industry was on display. Love this bag. Love The Sock Guy -- Jack Sweeney and I scored some a very funny pair of "Swag Whore" socks from The Sock Guy. You may have heard of a guy named Eddy in the bike business. You may have heard of this company. Nirve Bicycles out of Huntington Beach, Cali. had some wonderful cruisers. An artist was crafting this work throughout the show. I didn't troll The Strip much. Went into the Billagio to see their beautiful glass lobby ceiling. The Eiffel Tower -- kinda looks like it. Oldtime Vegas was the Rat Pack, the Golden Nugget and the casonos/strip joints along Fremont Street that has been turned into an outdoor mall/pedestrian square with video on the ceiling. 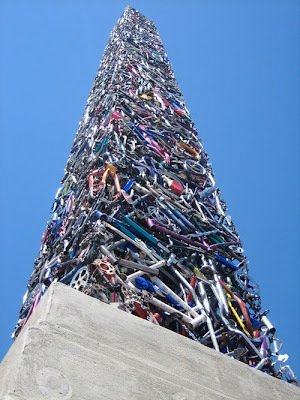 LAS VEGAS -- The bicycle industry's annual trade show is a dream world for bicyclists. 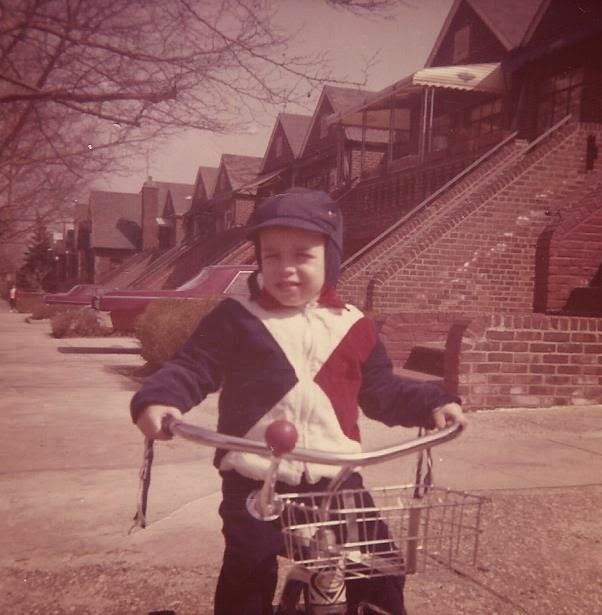 For me, it's my first serious efforts to market Alan Snel Bicycle Energy, LLC in a face-to-face manner to bicycle manufacturers, dealers, companies and groups. -- The National Bicycle Dealers Association seminars are excellent. I liked the one where the speaker spent 90 minutes offering hints, tips and suggestions on how best to provide service and repairs to customers. Be empathetic, don't use techno language and use the word, 'we," a lot. -- The accessories are to kill for -- it's delightful to see the array of colorful and cool bicycle bags, lights, baskets and clothing at the show. -- The segments of urban bikes, cruiser bikes and electric bikes are growing. -- It's fun just to float around the show and let your spirit take you from booth. 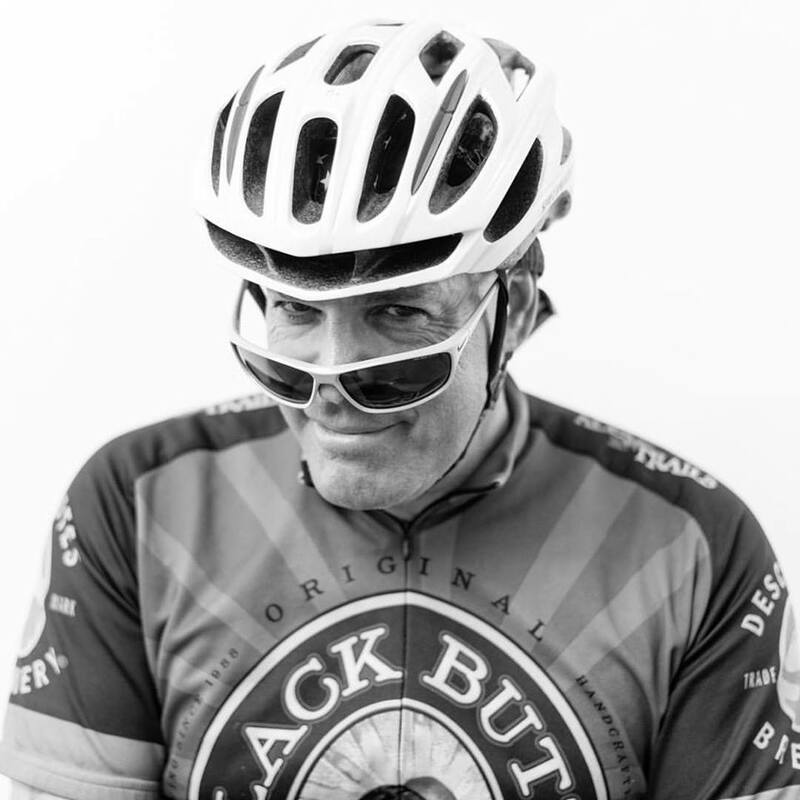 -- It's amazing how easy it is to talk bicycling with people from around the country. LAS VEGAS -- For years, I reported about new businesses being launched for newspapers around the country. Now, I can write about my own new incorporated business -- Alan Snel Bicycle Energy, LLC -- a business designed to provide bicycle advocacy, promotions, political lobbying, news releases and event organizing for bicycle companies, bike retailers and bicycle organizations around the nation. To launch my business, I'm here at the epicenter of the bicycle industry -- the Interbike trade show in Las Vegas where thousands of exhibitors are prepping their booths as I write this post. Interbike is the annual bicycle show for everyone in the industry to showcase their wares -- from bicycle companies and manufacturers to every company that makes a part, accessory and piece of clothing associated with bicycling. I am looking to expand my services that I currently provide for SWFBUD (South West Florida Bicycke United Dewalers) to a national stage. For SWFBUD, my many roles include putting on the Bicycle Bash festival every year, lobbying local governments to enhance bicycle infrastructure and increasing the profile of bicycling in Tampa Bay by getting the local media to report about bicycle issues. I have done public relations work for Steve Toll, a Tampa resident who has created the ISM seat -- a special bike saddle now used by the likes of Lance Armstrong on his time-trial bike to American women triathletes in the Olympics. Since I do work for Steve, I am at his booth right under the giant 4600 banner in the mammoth Sands Convention Center. I will be here throughout the week and will also be reporting newsy items from Interbike. Besides Steve, other Tampa Bay bicycle folks are here -- retailers David Luppino of Just Ride Bicycles in Riverview and Tom Jessup of Chainwheel Drive in Clearwater; Ellen and Bill of American Classic, the Tampa-based wheel makers; and other employees of Just Ride Bicycles and Chainwheel Drive. 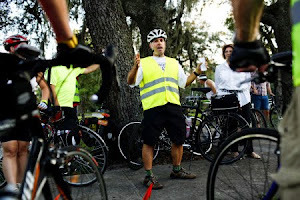 And I will be seeing my Seminole Heights bicycle compatriot Jack Sweeney, who is here with his bikecommuters.com pal. It should be a great week and stay tuned for more coverage. A bicyclist struck by a car and mortally wounded. This time, the dateline is Lakeland in Polk County. The fatal accident closed Highway 98 in north Lakeland in Polk County early this morning. A bicyclist was hit and killed after being struck from behind near Duff Road early this morning. Except that another bicyclist in the Tampa Bay area has been killed. 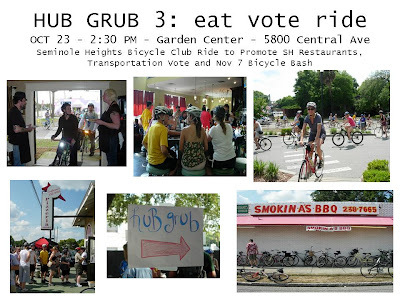 The Seminole Heights Bicycle Club is proud to present Hub Grub 3: eat vote ride on OCT 23 at 2:30PM. Usual meeting place: In front of the Garden Center at 5800 Central Avenue, Seminole Heights. It's free and as usual, this is a meet-up style bike ride and you assume full responsibility for your bike safety. Ride at your own risk. Thank you Tampa Police Lt. John Newman for puting this portable sign showing bike-safety messages on Central Avenue -- I took this photo during this weekend's long ride. On the way to Davis Islands from Seminole Heights. Here's Dale using Chip Thomas' favorite bike safety tool -- the mirror. Getting the required 3 feet space between passing motorized vehicle and bicycle. A bike ride to Davis Islands always means a stop in front of the Jeter the Cheater Compound. Some Gator fans let their rooting go to their wheels -- complete with tail. Saw this Gator-mobile on Park Circle in Seminole Heights. Thank you SunTrust building in downtown Tampa for this spacious new bicycle parking area. I guess you should be grateful for whatever you get when you're a bicyclist in Tampa. 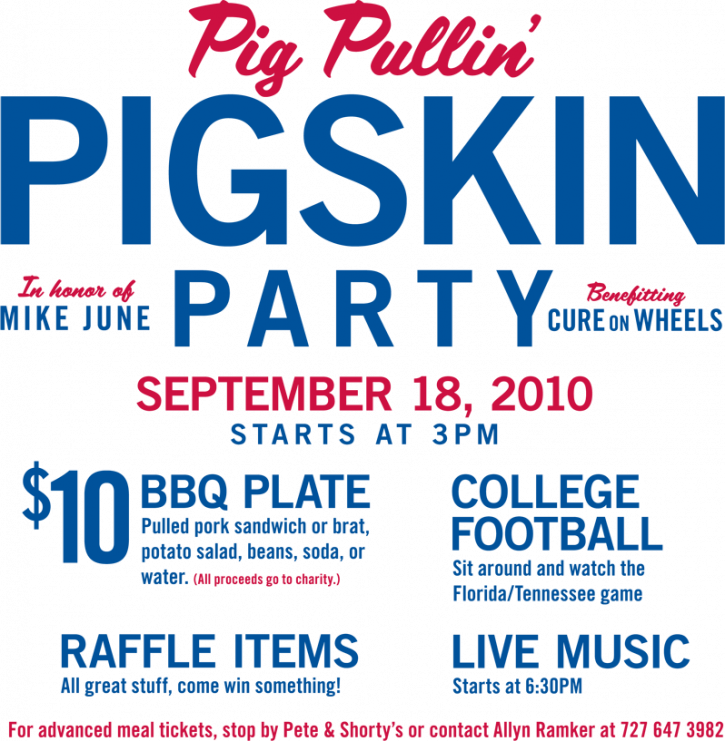 One more call out -- do you have a 3 Feet Please jersey and want to be part of a photo and video shoot? Email me. 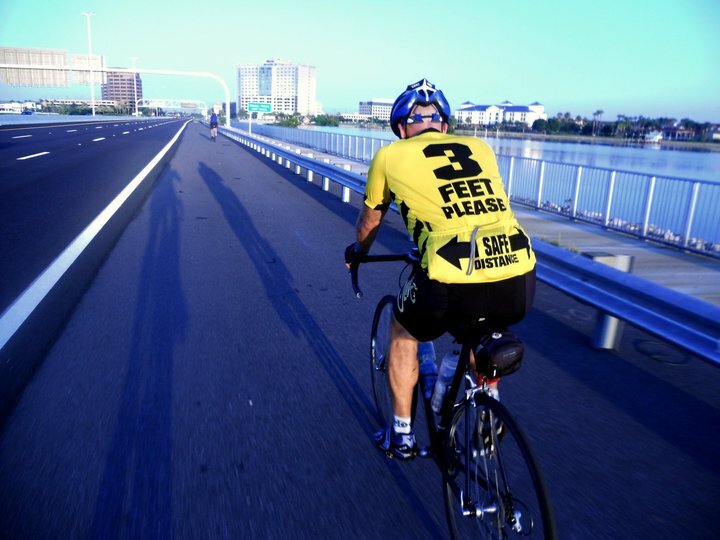 Tampa Bay lost another bicyclist today -- this time, it's in St. Pete. A bicyclist who was struck six days ago in St. Petersburg has succumbed to his injuried and has died today. St. Pete Times Sue Carlton and I talked earlier this week about the bicycle scene in Tampa and today her column hit the streets. 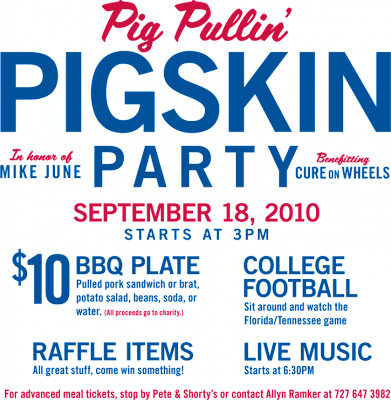 Cure on Wheels, the presenting sponsor of the 2010 Bicycle Bash on Nov 7, has a cool event Saturday. Bicycle Stories greetings to those early-morning car drivers heading south on Morris Bridge Road who meet my hand greetings with a smile, wave or a peace sign. As I head north on Morris Bridge Road to Flatwoods Park every morning, I see a caravan of commuting cars heading in the opposite direction. Most ignore my peace sign or power fist greeting or wave, but there is a significant number of drivers who give the thumb's up or a cheerful wave as they drive south to I-75 and Fletcher Avenue. The truth is the majority of drivers I see in the morning look like zombies behind the wheel. I feel sad for them because driving a car has rendered them lifeless. I think they need to ride a bike. I'm glad to report that Picot Floyd, struck by a car while riding his bicycle Sunday morning, is doing better. He was mighty sore Monday morning, but is feeling better. His tire tube, however, has seen better days. But a punctured tube doesn't mean it's the end of the line for that tube. Picot just adds another patch and he's good to go. Keep on re-cycling those bicycle tubes Picot. I Wonder If My Old Bike Is In There?